KSA, Mumbai: Maharaja XI (Air India) and RBI (Reserve Bank of India) have made it through to the finals of the KSA Veterans Football Tournament, 2017 being held at Cross Maidan. Both the games had to go the penalties as the were no winners to be decided after normal time. Both teams knew what they were up against as a place in the final was up for grabs. The game started on the slower side but both teams soon found their confidence and started creating chances. Both the defences were on top of their game as they were foiling every chance the opponent created. The defensive battles were intense as tackles flew in and soon Harish Poojani of SBI was awarded a yellow card. The game finished 0-0 at full time and had to be decided on penalties. First up was the former India player Noushad Moosa for the Maharaja XI who slotted past SBI’s Clayton Cardozo. The Maharaja XI keeper Shayam Sawant then saved two penalties and the job was finished off by Simon D’Souza as Maharaja XI won 4-1 on penalties and booking a place in the finals. The second semi-final was very similar to the first one as both teams started on a cautious note knowing that if they concede a goal at this stage it would be difficult to come back from that. But soon the game opened up and the chances started flowing both ways. But the chances were not enough to create a goal for either side as the defence remained strong for both teams. The game was to be decided on penalties and both teams scored 4 and missed 1 each. 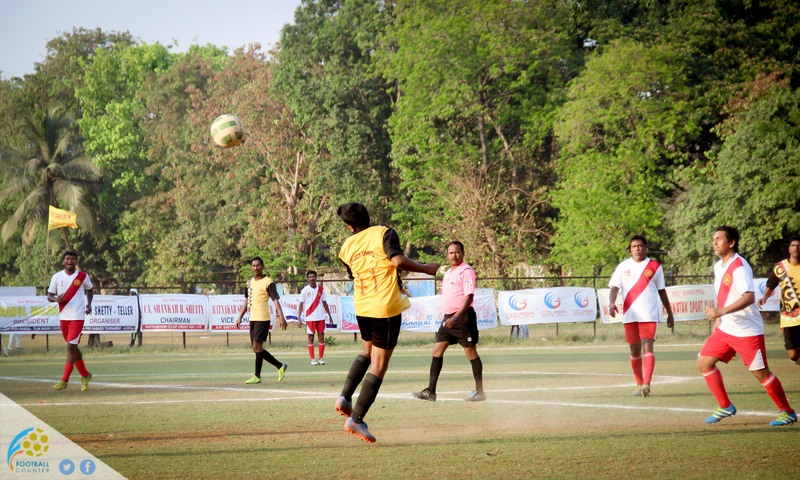 So the penalties were into the sudden death and Sachin Narsappa was up for RBI who put it past the Gunners’ keeper making it 5-4 as the Gunners had missed their sudden death penalty meaning RBI were through to the finals. So, after all the drama of the Semifinals two of the best teams for the tournament meet in the finals as Maharaja XI will lock horns with RBI should amplify tomorrows thrill.